After over 100 hours of research and number of tests we did in order to find the best car tire for most people, and Milestar MS932 Sport stood out with its impeccable performance in different conditions and its affordable price makes for a premium tire for a fraction of the premium price. Dependable and durable, Milestar MS932 Sport proved as an excellent choice for all seasons. Thanks to optimized threads, you can use them year-round, and 50,000-mile warranty ensures you’re more than covered. They perform great on both dry and wet roads, and we were especially surprised how well they perform in snow. Milestar MS932 Sport tires definitely offer more than the price indicates, and can easily outperform much pricier tires. If you’re on a tight budget, but still need reliable tires to use year-round, Westlake RP18 are a good choice. With a 40,000-mile warranty and somewhat challenged performance when tested in snow, these tires offer less than our top pick. However, if you’re looking for cheap tires that are stable and safe, or live in an area which doesn’t have that much snow, Westlake RP18 are a good choice. When should I replace the tires on my car? Which type of car tires should I choose? Excluding the obvious reasons, like a flat tire, there are many factors that indicate that it’s time to replace your tires with a new set. There is no exact information on how long will your tires last, since it all depends on their usage, maintenance, road conditions, etc. To make sure your tires are fit for driving, regularly check them, and schedule routine appointments with tire technicians, which can determine potential faults you can’t notice yourself. There are many important factors that indicate it’s time for you to replace your tires, but two main ones are tread wear and tire aging. Thread wear is pretty easy to spot, since you’ll both be able to see significant thinning of the thread and feel the unreliability of the tires on the road, but tire aging doesn’t leave apparent outside signs. According to a study done by European Commission for Mobility and Transport, tire aging factor is especially easy to overlook on vehicles that aren’t used often, but, their tires are, nevertheless, unsafe to use even without any obvious outside signs of deterioration. Tires start to deteriorate from inside, so, in order to avoid any unpleasant surprises on the road, check if your tires are below the recommended age limit, which is between 4 and 10 years, depending on the model. Another very important thing is proper maintenance, which can prolong the life of your tires, and provide a safer ride. According to a study by the National Highway Traffic Safety Administration, if you don’t inflate your tires regularly and do routine check of their wear, the likelihood you’ll crash is three times bigger than it would be if your tires were in great shape. Tanya Mohn, in her article for Forbes, explores NHTSA studies, and advises drivers to make an effort when it comes to maintenance, from inflating to rotation and alignment, since it can prolong your tires usability for another 4,700 miles. But, even with the proper maintenance, your tires will eventually need to be changed, so, in order to ensure your new ones will last longer, choose the best car tires for most people that will be more durable and reliable than your last ones. There are three basic types of car tires- winter, summer and all-season car tires. The most economical choice is to go for the all-season tires, since they are, as the name suggests, designed in that way that you can safely and comfortably drive with them during the whole year. However, these type of tires aren’t suitable for harsh winters, and the whole-year rule really applies only to drivers who live in the areas that have mild winters and light snow. In case you have heavy snow and really cold winters, you’ll have to buy special winter tires to ensure safety. Winter tires are heavy-duty tires which are often needed if you don’t have all-season tires or have harsh winters, and they are designed to withstand low-temperatures without experiencing damage and to provide you with better grip, handling and braking in winter conditions. Summer tires are only used if you decide on winter-summer tire combination, rather than all-season tires. They can be used in both wet and dry conditions, but they can’t be used in cold weather, since they don’t handle low temperatures well. When you choose car tires according to your weather preference, you can significantly narrow down your search by including your other specific needs. Depending on what you want- tires with an overall outstanding performance, high-performance tires for high speed, off-road adventurer tires, etc- you’ll be able to find tires that will perfectly satisfy your on individual needs. Dry & wet test. It was extremely important that the ideal tires perform equally well in both on dry and wet roads, without any difficulties. In order to maximize the use you get for the price you pay, tires really should be functional and reliable for the whole year, and not only for one season. Snow test. To make sure you won’t be needing another set of tires in the winter, we tested our contenders in the snow, too. But, we do recommend winter tires if you live in an area with harsh winters, since our tests were conducted in conditions that had mild snow and temperatures not under 20 Fahrenheit’s below zero. Braking & handling. Reliable tires can literally be a life saver, so it was of outmost importance for tires to score well in this category, regardless of the conditions, we wanted only impeccable performance from tires we would choose as our top pick. These highly affordable tires were quite the surprise in our testing, since we really didn’t expect that Milestar MS932 Sport could ever outperform some much pricier and popular models. But, we were really wrong, since Milestar MS932 Sport proved to be best tires for most people, offering a smooth and safe ride for a fraction of the cost you would have with some of the more popular brands. These all-season tires handled every weather condition we put them through with ease, and both wet and dry roads were a light task for these affordable overachievers. Snow posed no problem as well, although it was light, it still changed road conditions enough for us to get a feel how Milestar MS932 Sport handle snow on the road. Specially optimized treads make these tires a great choice for all seasons, and with added water evacuation groves, they are the perfect choice for driving in both wet and dry roads, without facing any problems. From the moment the tires were mounted on the car, we could immediately sense how they affected smoothness of the ride. The ride was instantly better, more comfortable, and the braking and handling were superb, even during rain and snow, which was a big plus. Wide circumferential ribs prevent loss of traction in the wet conditions, and offer better handling and grip than we could see in other tires we tested. Speed rated with a ‘V’, which means you can easily go up to a maximum of 149 mph (240 kph) with them, they are specially designed to ensure a safe and reliable ride even in high speeds, and we definitely could feel that the manufacturers really put in their effort to make this model of tires the best for most people, regardless of their needs and driving background. Milestar MS932 performed superb when we drove in average speed, but it held its own even as we approached 149 mph limit. With a 50,000-mile warranty, you already have a good deal, but Milestar manufacturers went above and beyond to create a tire that will be durable and reliable, so they equipped these tires not only with great treads, but with angled and longitudinal siping also, which additionally prolong the life of these tires. Their effort landed their tires a 540 treadwear grade, which, combined with A’s for both temperature and traction grades, ensures that these tires truly have an outstanding performance and longevity. With these tires, you’ll truly be in control of your car, and the steering will be effortless, with great handling and traction these tires provide. Thanks to high speed rating, these tires we’ll be reliable in wide range of situations, whether you’re driving around the city or on the highway, you will always be properly adjusted to your driving environment. Milestar MS932 has tires in sizes from 14′ to 20′, so their versatility and compatibility with a wide range of models is really an advantage. This low-cost, high performance tires are quite the overachiever, and they proved to really offer most value for price, and they are the best choice for most people. If we tested these tires only on one car, we wouldn’t be able to name any flaw, but, that’s precisely where double testing came as enlightening. When we mounted Milestar MS932 on the Mercedes Benz, they exposed a potential flaw. Even though they still performed great, they were noisier than they were on the Ford Focus. Whereas on the first model, the ride was almost noiseless, in a luxury car, noise became much more apparent. We suspect it’s due to the design of this particular car, which has ultra-quiet engine, which revealed the noise, but, it is a thing to have in mind when you choose these tires. Although it isn’t a deal breaker in most cases, some models of cars won’t have a quite ride with Milestar MS932, but, in most cases, you’re in for a smooth and quiet ride with these tires. Goodyear Fortera HL are definitely pricier than our top pick, but, if your budget allows this cost, they are really worth it. Goodyear is a trusted, quality brand, and they didn’t disappoint with Fortera HL, which had great overall performance. Deep, intricately designed threads with tread block elements make for a great ride, providing safety and great performance in all weather conditions. The grip and handling are great with Goodyear Fortera HL both in dry and wet roads, and specially designed blades and grooves have amazing results when driving in snow or rain. Even though we tested in conditions where snow was light, these tires had amazing results, and other users reported that they managed driving with them even with heavy snowing, and we aren’t surprised, considering how great it performed in our tests. With an ‘S’ speed rating, they fail to live up to the standards our top pick set, but, with 112 mph limit, it’s still more than enough for most people. However, they do have an advantage over our top pick- they are as silent as it can be, both on Ford Focus and Mercedes Benz, so they are a great pick for luxury cars, too. Threadwear of Goodyear Fortera HL is graded 540, which ensures durability of the tires, and A for the traction. Although the temperature rating is B for this model, during our tests, it performed great without any sensitivity to the current temperature, but it would be better if it had an A, as our top pick. With its unique thread design, which was designed with much care, Goodyear Fortera HL make sure that your ride is as smooth and quite as it can be, and traction, braking and handling are first-class. They have amazing grip on the road, wet and dry equally, and steering was a joy with these tires, since you won’t even notice the difference between conditions of the road. Even though they are pricier than our top pick, 60,000-mile warranty ensures you get your money’s from these durable tires, and the smoothness of the ride is impressive. When you’re on a really tight budget, but want reliable tires, Westlake RP18 are a great choice. With a bargain price, they are undoubtedly a great option for the budget-conscious driver, and their low price doesn’t signify their quality, which is quite higher than the price indicates. Tread pattern on these tires is designed symmetrically, in order to enhance thread longevity and siping patterns help water dispersion and stability. However, threadwear grade for Westlake RP18 is 500 which isn’t bad at all, but it still ranks them lower than our top and step-up pick, and, along with 40,000-mile warranty, it indicates that thread will wear out faster. It passed temperature and traction ratings with flying colors, scoring A’s in both categories, which is really noticeable when handling and steering these tires. Even though budget options don’t always have great performance, Westlake RP18 were reliable in wet roads same as they were on dry roads, and rain didn’t impede its performance. When we tested these tires during snow, we were skeptic, but it managed to decently perform even in inter conditions. However, if you have low temperatures and heavy snow in the winter, we wouldn’t recommend for you to rely on these tires. These tires offer good performance for a bargain price, and they are definitely one of the more underrated tires on the market. They did make some noise on the luxury car, but in most vehicles, they will be quiet and efficient in variety of different weather conditions. 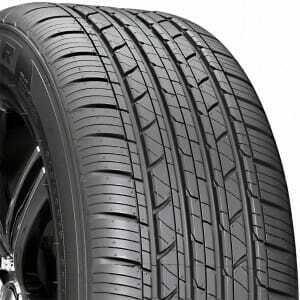 If you don’t mind the slight difference in thread longevity, or can’t afford tires more expensive than these, Westlake RP18 could be the best car tires for you. When it comes to tires that can handle rough terrains as well as standard ones, Cooper Discoverer A/T3 blows away the competition by far. Aggressive 5-rib thread design makes off road destinations easily reachable as you were on the highway and not on rougher terrain. But, masterfully designed threads are not the only advantage these tires have when it comes to off-road driving- special silica based tread compound is used in tire manufacture, to ensure great traction on wet roads, and to minimize the potential damage that occurs on rough terrain, like cuts from gravel or small rocks. It goes without saying that Cooper Discoverer A/T3 effortlessly handle dry and wet roads, both in highway or city environment, and when you decide it’s time for an off-road adventure. Snow makes no difference for these tires, so you can use them even in the harsh winters- they won’t break a sweat. Speed rating for these tires is ‘R’, which makes for a maximum speed of 106 mph, but, it’s more than enough considering it’s primarily designed to handle rough terrains, in which higher speed is often virtually impossible to achieve. Dual draft tread element walls and lateral groove protectors are superb additions that make stone retention great, and minimize the risk of chips and cuts which often occur with lower quality tires in rough terrains. If you need tires that are unique due to their perfect performance on-road and off-road, and that ill ride smoothly on the highway and in the desert without you noticing any difference, Cooper Discoverer A/T3 are the choice for you. Considering the constant rise in the fuel prices, investing in Goodyear Assurance Fuel Max might just be the most cost-effective choice in the long run. According to Goodyear’s tests, with a set of these tires, you can save up to 2,600 miles worth of gas during their lifetime, which according to their warranty, is placed somewhere around 65,000 miles. In order to achieve fuel-saving they promise, Goodyear Assurance Fuel Max is optimized to provide lo rolling resistance, which cuts down on energy consumption. These tires are meant to be used for the whole year, and they perform great both in dry and wet conditions. Dual aqua channels regulate hydroplaning and outer dry zone handles dry terrain equally reliable. When it comes to the snow, same as our top pick, it can handle light snow and milder winters, but in case you face harsh winters every year, Goodyear Assurance Fuel Max won’t be able to cover you for the winter. Thread design provides great traction in different weather condition, and provide a good, smooth ride, and the threadwear rating of 600 makes for great durability and long lifetime of threads. Traction is rated with A, which is pretty clear the first time you drive with these tires, and temperature is rated with a B. With a speed rated with ‘T’, these tires will be a good choice if you don’t go over the 118 mph speed limit. If you live in an area that has harsh winters, and it’s impossible to go through this season without dedicated winter tires, General AltiMAX Arctic Winter Tire is the best choice. Unique design centered on the best possible performance in low temperatures makes these tires perfect for driving in winter. When it comes to winter tires, General AltiMAX Arctic Winter Tire really has no competition- their one-of-a-kind thread design with multi-angle sipe system, and directional pattern with center stability rib outperforms every other tire model in the winter conditions. These tires also have a special technology called Reactive Contour Technology, or RCT, which enables them to quickly adjust to different surfaces and maintain contact with them, providing the perfect grip in variety of low-temperature conditions, which makes them indispensable in the winter period. Speed rated with ‘Q’ signifies that the maximum speed limit is 99 mph , but it’s expected speed limit in the winter, whether with dedicated winter tires or studded ones. Innovative and technologically advanced design make General AltiMAX Arctic Winter Tire best winter tires on the market, that will be great choice for most people who face heavy snow and harsh winters every year. Specifically designed to provide outstanding performance in extreme driving conditions, Hankook Ventus V12 EVO K110 is the choice for drivers who love to drive fast, but still want the best possible control and comfort when driving. These tires have ‘Z’ speed rating, which puts them at the newest generation of tires created for speedsters. This means that speed limit is marked as ‘over 149 mph’ without any maximum limit. Hankook Ventus V12 EVO K110 tires are designed to provide maximum stability and control during high-speed driving, so they implemented center tracking rib in the thread, which is made of HPSR (polymer and resin) compound for enhanced traction and braking hen driving on dry and wet roads. 3D effect on the thread ensures even contact with the road, and combined with previously mentioned features, this makes Hankook Ventus V12 EVO K110 the ultimate high-performance tires, that will allow you to indulge your need for speed, but, at the same time, make sure you’re safe and have maximum control over your car. Some tires are noisier than others, but none are as quiet as Michelin Defender. An all-time favorite tire manufacturer, Michelin offers great tires overall, but this model is known for its smooth, noise-free ride, and we agree. We tested them on both cars, and there was no difference- wet, dry, snow, fast or slow- Michelin Defender tires were quiet and smooth in every situation. Thread of these tires is designed and trademarked by Michelin, and they reflect their high-standards when it comes to safety and longevity. They have excellent grip on surface on both dry and wet roads, and they had great handling and steering results, maximizing their safety factor. Rated ‘T’ for their maximum 118 mph speed limit, they are a solid choice if you’re interested in reliable, basic tires that offer exceptionally quiet ride. If you’re living in a climate here wet roads are an everyday occurrence, and you need tires that seriously overachieve in this department, Continental ExtremeContact DWS are a great option. These tires make driving on wet roads ultra-safe and comfortable, and eliminate any possibility of swerving or slipping. Even high-performance on wet roads is an easy task with these tires, which have 168 mph speed limit, and, therefore, are rated with ‘W’. Although Continental ExtremeContact DWS performs great in all weather conditions, it truly excels on wet roads, during rain or light snow, thanks to uniquely designed thread that maximizes handling and braking in wet conditions. Since in some climates wet weather creates trouble for drivers who want high-performance, these tires are the best choice, since they allow you to drive at great speed on et roads, without compromising your safety and stability. If you already have winter tires, and you’re looking for ones you would use only in the summer, BFGoodrich g-Force Sport COMP-2 are top of the chain. With amazing acceleration, enhanced handling and out of this world braking, these tires are perfect for summer adventures, that will enable you to have fun and test the boundaries of your car, without risking your own safety. Sport design thread allows you to achieve great speed and handle your car more efficiently, and the unique COMP-2 compound used in the manufacture of these tires is inspired by racing technology, allowing for great steering response and great surface grip, whether it’s on dry or wet roads. Speed rated with ‘Z’ ensures that you’ll be comfortable driving faster than 149 mph, and be able to enjoy ultra-high performance in the summer. The great speed achievable with these tires doesn’t come with any strings attached, since control and comfort are outstanding. Combination of racing technology and street-driving cars makes for a truly unique combo that offers you security and stability, but at the same time, ability to achieve great speed. Choosing the right tires isn’t always easy, but it’s of utmost importance. Not only that the right tires will make your rides more enjoyable and pleasant, they will also ensure your safety. Depending on your needs, you can choose between buying all-season tires or winter and summer ones separately, and pick a model that offers features that are most convenient for you. If you’re looking for reliable and durable tires that will perform great during all seasons of the year, Milestar MS932 Sport tires are the best choice for most people, due to their affordable price and outstanding performance. In case you want t invest a little more to ensure your luxury car won’t deal with noisy tires, Goodyear Fortera HL are a great choice for the whole year. And, if you’re on a budget, but still want durable and dependable tires to get you through four seasons of the year, Westlake RP18 are a good choice for you.